The Royal Arch Route off the South Rim in western Grand Canyon is a 40 mile loop hike that is described "as the most difficult of the established South Rim routes.......appropriate for experienced Canyon hikers only......who have paid their dues and acquired the appropriate wilderness skills....whose experience allows proper rigging of rappel anchors. For those lacking the required skill and judgment this hike offers about a million ways to get into serous troube in a remote part of the Grand Canyon". 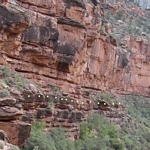 The standard route utilizes the South Bass Trail to gain access to the Esplanade platform about 1200' feet below the Grand Canyon Rim. Westward travel on the Esplanade brings one to the east arm of Royal Arch Canyon through which the route essentially follows the bottom of the drainage to join the main canyon. From there it is a march down canyon to Royal Arch. Backtracking 1/2 mile up from the Arch, one climbs out of the canyon to the east. A 20' rappel allows access to the Colorado River at Toltec Beach. From there, one makes their way below the Tapeats cliffs to Garnet Canyon where it is possible to climb up onto the Tonto Platform and "walk" to the lower South Bass Trail. It is then south up South Bass Canyon to the trailhead on the rim. My brother in law, Neil F., had wanted to do this hike for a long time. I had repeatedly begged off after seeing photos of "The Ledge" a very narrow exposed traverse that was only a few inches wide that had to be accomplished to bypass an impassable waterfall. There was no way that I was going to attempt that ledge! However as we continued to research info on the route, we read about a bypass on the opposite side of the canyon from the Ledge that was not nearly as "nerve wracking". This new knowledge re-kindled interest in the hike and I agreed to try it. So we picked a day and drove up to the canyon and made arrangements for a 5 day hike in early October. We were concerned about the wisdom in the two of us tackling the route, but finally decided that this was not our first "rodeo" and that as long as we were careful that we should be fine. October 10th: We left Tucson early and drove to Flagstaff and then on to the Back Country Office at the Canyon. The ranger at the desk had no current info on the route. He did have two suggestions-- load up with water whenever possible especially for the section between Toltec Beach and the South Bass Trail and watch out for the heat. He also reported that there were no other permits for the time period that we would be on the route and that we shouldn't see any other hikers. That afternoon we drove out to Pasture Wash, passed through the checkpoint at the Hualapai reservation boundary without having to pay their fees and made our way to the camp site on the rim at the Signal Hill camp area. On the way in, we stopped to look over the abandoned Pasture Wash Ranger Station and the Signal Hill Lookout tower. The campsite right on the edge of the rim was a good one with a spectacular view up the Canyon towards Grand Canyon Village. October 11th: We got up very early and Neil fixed a big breakfast on the campstove. I had been feeling ill on the days prior to leaving Tucson, but this morning I felt much better. After the drive from our campsite over to the South Bass Trailhead, it did not take long for us to load up and head out. Neil decided to leave his tent and several other items behind that he didn't think that he would use because of the mild weather that had been forecast. He also decided to go light on the amount of water that he would carry. He was confident that we would find some along the route. I was not as certain and loaded up with 9 liters--7 for the next day or so and 2 to stash at the junction where we would leave the South Bass Trail about 1.2 miles below the rim. The walk off the rim went well and we were soon at the point where we would turn west on the Esplanade platform. We each cached two liters of water for the return trip. In the upper reaches of the canyon, we had passed several pools of water and I wondered whether I had done the right thing in carrying so much water, but I did not pour any out! We finally came to the impassable dropoff, with the "Ledge" to the left and the newly found bypass to the right. The Ledge was as intimidating in person as it had appeared in the photos. We had read that the bypass route to the right was somewhat indefinite, but armed with photos of a crawl through and a "crack" down through a cliff band, we kept moving at a slow but steady rate. There was one nervous move just above the crack that was a long step down. It was necessary to be careful that your pack did not cause you to pitch forward. Below the crack in the rocks, the footing was loose but we regained the bottom of the canyon without incident. There weren't too many places to camp below the waterfall so we kept moving while keeping an eye out for water and a spot to throw down . There had been several pools above the waterfall, but there was only one very muddy pool below! Just before dark we came to a rock outcrop that was flat enough for two sleeping bags and we decided to call it a day. We had traveled about 10 miles from South Bass Trailhead on the rim. At this point Royal Arch Canyon turns hard to the north. Scouting downstream, and up a small side canyon turned up no water. Neil climbed up a bit higher on the west wall and discovered a small pool from which he pumped several liters of water. Since I had water, I was able to return to camp. Our scouting trip down canyon brought us to a large clog of boulders that we were going to have to make our way down first thing in the morning. October 12th: Early morning temperatures were quite mild, so we turned out and had coffee water warming before daylight. We were on our way soon after it became light enough to see clearly. Neil used our rope as a handline to downclimb the boulder clog. Before I came down, we determined that the rope was not going to pull through with both of us at the bottom. So we took the rope loose and I was able to wedge myself against the roof of one of the boulders and came down rather easily. The rest of the morning was spent slowly making our way down through the Redwall narrows of the canyon. The bottom was often choked with boulders. We kept anticipating that we were going to come to the deep pools mentioned in several reports that would be necessary to swim or wade. We were not disappointed that they were all dry or had very little water! At the location of one of those pools we had read about a climber's path to bypass--we were very glad that it was not necessary to take that route--in fact, once I saw the bypass in person, I decided that if it had not been dry that I would have chosen to swim the pool. Late morning brought us to the exit point at which we would leave the canyon to continue to the rappel and the river at Toltec Beach. This exit point was obvious but did not agree with the co-ordinates that either of us got off our maps. We left our packs near the stacks of cairns and loaded up our water filters and water bags and hoofed it down canyon the half mile to Royal Arch. It was not the easiest of walking to the Arch. About halfway there, permanent running water made its appearance. This section of Royal Arch Canyon was very scenic with the water, waterfalls, and greenery! We were both impressed by the size of the arch. It looked much larger in person that what we had seen in the photographs. From the reports that we had read, camping at the Arch is fairly popular. I don't believe that the effort to bring our packs that far would have been worth it to us. After a photo session and time spent pumping water, we made our way back to the packs and started the climb out of the canyon. This section of the trail was surprisingly primitive and very steep. Once the top of the cliffs had been reached, the path leveled out but stayed really close to the rim--not a place for vertigo! We eventually turned onto a wide shelf and headed east to do the rappel. The climb down to the ledge leading to the anchor was the most nervous part of the trip for me. From the top of the climb, I could not see the transition to the ledge. I climbed down on belay without my pack. Once I could see the layout, I was fine and took the rope off. There were several anchor slings in place that had previously been used. Connected to them was a knotted rope that went part way down the 20 foot face. We added our sling and tied a 30' rope to locking carabiners that had been left behind. Neil was the first to go down. I lowered the packs and then joined him. From the landing, it was about an hour to the river with the last few hundred yards pretty slow going on very loose material. We got to Toltec Beach in time to wash up and set up a camp before dark. Supposedly the hardest part of the trip was now behind us. From here the travel eastward and then back to the rim was going to be a more conventional type of Grand Canyon hike. A lot of pressure was off! October 13th: We got a slow start on the 13th. My Whisperlite stove had quit on me the night before so I took some time to disassemble it, and clean it up. It was pretty encouraging to have it roar back to life. I had not been looking forward to eating cold food for the rest of the trip. It was decided to skip Elves Chasm on this trip and instead head for Copper Canyon quite a distance to the east. Once again, I loaded up with a full quota of water--Neil was still confident that water would be found. It was 9am before we finally hit the trail. The initial going was very slow. There were some incredibly sharp limestone rocks to climb over that really slowed us down. We eventually ended up a couple hundred feet above the river. As we were making our way, a group of rafters passed below us. Neil surprised the heck out of them when he shouted out to them. They were suitably impressed with our position above them! Not too much later we came across several pools of water--but they were very salty. Once again I was glad to have water in my pack. There were also pools of water in Garnet. The Tonto Trail officially starts at Garnet. Once the plateau was gained, the walking on the trail was straightforward but tedious. The highlight of this section of trail was the appearance of four bighorn sheep--one of which that had a massive set of horns. It was pretty late in the day when we finally rolled into Copper Canyon. We had come about 9 miles from Toltec Beach. Camp was set up on a large flat rock and then we headed out exploring for water. I went downstream and came across a couple of small pools that were very muddy. Neil went upstream and located a pool of clear water. Once again, his confidence in being able to locate water had paid off! October 14th: The day started off early. Once again we were up at daylight. From our camp in Copper Canyon, we had two options for the day. We could continue eastward to the edge of South Bass Canyon, drop off steeply to the bottom and then follow the South Bass Trail to the river where we would spend the rest of the day. The next morning we would hike the full length of the South Bass Trail out to the rim. Or, option 2 was to stay on the TontoTrail when we got to South Bass Canyon and follow it to the south as it contoured to intercept the South Bass Trail closer to the rim. From there we could continue on up to the trailhead and be out a day early! Since we had plenty of water we decided to head for the rim. Before hitting the trail that morning, we walked around a bit to loosen up for the day. When I came back to my pack I noticed a wet spot on the ground. Inspection showed that the valve on my hydration system had opened, and I had lost 2 liters of water--water that I had humped 9 miles from Toltec Beach the day before! Thankfully, the pool that Neil had discovered the night before was available! The walk across the Tonto was uneventful, but it was pretty warm. If we could have started out at the time we originally planned that morning it would have been much more enjoyable. As before, the trail hugged the edge of the Tonto platform and it was necessary to watch your step. We took a break overlooking North Bass Canyon across the river and watched a group of rafts negotiate the rapids. Once we reached the South Bass Trail, it was all uphill to the rim. The climb through the Redwall and Supai formations was quite tiring. It was late afternoon when we reached our water caches left four days earlier. We took quite a long break to eat and drink. Just a little over an hour after re-shouldering our packs we were back on the Rim. Mission accomplished--another 9-10 mile day, and the Royal Arch Route completed. We drove back into Grand Canyon village that evening, took showers and eventually ended up at a pizza place for dinner.